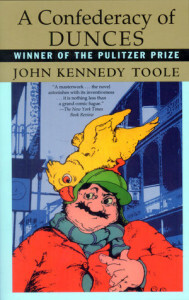 When I first read Confederacy of Dunces, I would only allow myself one chapter a day. I knew the author died at a young age, leaving only one other book, so I couldn’t bear for this one to end. Brilliant, satirical, heartbreakingly funny and the single best written transcription of Louisiana’s unique patois ever penned. I only wish I could read this book for the first time again and again.